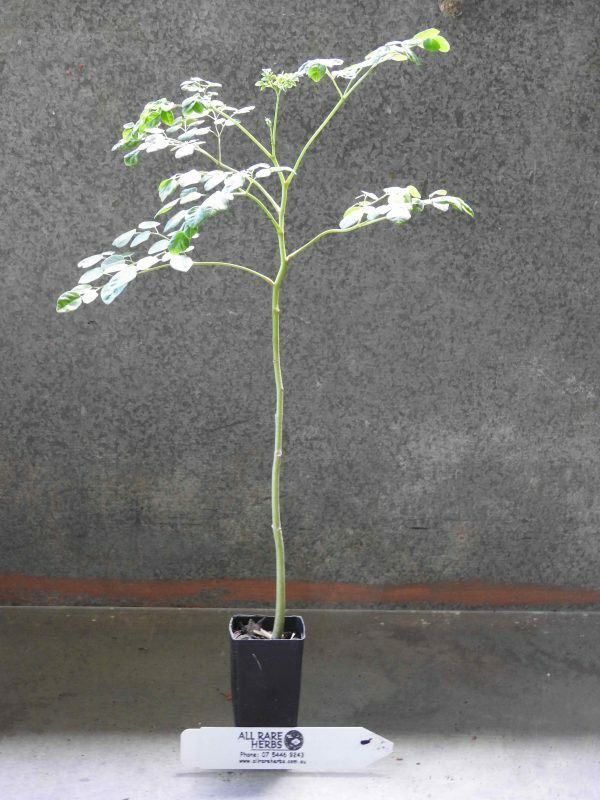 Drumstick Tree plant, Moringa oleifera, is also known as Horseradish Tree. The roots of Drumstick Tree have a flavour very similar to that of Horseradish. The edible bark, leaves, roots, immature seed pods and seeds are valued as food source. Seed pods and leaves contain 38 % protein with nearly all essential amino acids, making it an excellent alternative to meat. Traditional Asian folk use of the roots as a remedy for asthma, bladder stones and gout. The ancient egyptians used the oil from the seeds as a base for perfume. Crushed seeds used as water purifier. Drumstick Tree plant is a native of India and prefers rich, moist well-drained soils in a protected, sunny position. Clusters of scented yellow and white flowers. Drought and frost tender. It is a deciduous tree, growing to 8m x 3m.